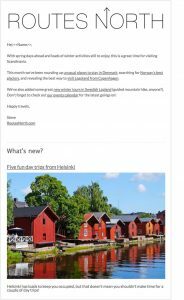 If you want the inside track on travelling in Scandinavia, don’t miss the chance to sign up to our info-packed email updates! The Routes North newsletter is always totally free, and are as a subscriber you’ll be the first to know about all the fun new stuff that’s happening in Scandinavia. Sign up now for free tips! ? See some of our newsletters in full! Routes North is an independent travel guide. Our writers never take free stuff. So when we say that we like a place, you know we really mean it.